There are many gifts of the Spirit but what about the gift of prophecy? Is this gift still available? How would you know if you have it? For one thing, we need to understand that the gifts of the Spirit are outside of ourselves as these are gifts of God. No one can brag or boast about having a gift for Paul wrote “For who sees anything different in you? What do you have that you did not receive? If then you received it, why do you boast as if you did not receive it” (1 Cor 4:7)? Paul was not strictly speaking about the receiving of spiritual gifts but the idea remains the same; we receive the gifts of the Spirit as it pleases God, not us. A gift is unmerited just as we did nothing to earn a birthday gift so too are the gifts of the Spirit Paul writes “Now there are varieties of gifts, but the same Spirit; 5 and there are varieties of service, but the same Lord” (1 Cor 12:4) and “these are empowered by one and the same Spirit, who apportions to each one individually as he wills” (1 Cor 12:11) not as we will or as it pleases us. Some of the gifts are mentioned in 1 Corinthians 12:8-11 “For to one is given through the Spirit the utterance of wisdom, and to another the utterance of knowledge according to the same Spirit, to another faith by the same Spirit, to another gifts of healing by the one Spirit, to another the working of miracles, to another prophecy, to another the ability to distinguish between spirits, to another various kinds of tongues, to another the interpretation of tongues.” This is not an exhaustive list of the gifts as they are mentioned elsewhere in Scripture like in Romans 12 but we will focus on the gift of prophecy and what exactly this gift is. The gift of prophecy is mentioned in 1 Corinthians 12:10 and the Greek word Paul uses for the word prophecy is “prophēteia” and means “a discourse emanating from divine inspiration” and it is with the express purpose of “reproving and admonishing the wicked” but also “comforting the afflicted” and lastly, “foretelling future events” so the word prophecy does not always mean telling about future events. The way in which the word prophecy is used in the New Testament is “forth telling” or to “speak forth” the teachings of God and to even interpret God’s purposes from Scripture but it is not always and every time prophesying about a future event. In fact, the only place that I could see there were prophecies in the New Testament about the future were given by Christ about the end of the age and the way the disciples would be treated but also by Simeon who said that “to Mary, [Jesus’] mother: “This child is destined to cause the falling and rising of many in Israel, and to be a sign that will be spoken against, so that the thoughts of many hearts will be revealed. And a sword will pierce your own soul too” (Luke 2:34-35). Today, there is no shortage of those who proclaim themselves to be prophets but Peter warns us “false prophets also arose among the people, just as there will be false teachers among you, who will secretly bring in destructive heresies, even denying the Master who bought them, bringing upon themselves swift destruction. And many will follow their sensuality, and because of them the way of truth will be blasphemed. And in their greed they will exploit you with false words. Their condemnation from long ago is not idle, and their destruction is not asleep” (2 Pet 2:1-3). Paul shows us in the Scriptures how those who had the gift of prophecy were using it like in 1 Corinthians 14:3 where he writes that “the one who prophesies speaks to people for their upbuilding and encouragement and consolation.” There is no mention of the one who has this gift is ever prophesying about future events. On the contrary, he is relating to things that are presently occurring. The one who is prophesying is speaking to the people for the purpose of “their upbuidling and encouragement and consolation” not telling them what will happen. Indeed, the “the one who prophesies builds up the church” (1 Cor 14:4) not telling the church what is to come. In fact, “one who prophesies is greater than the one who speaks in tongues” (1 Cor 14:5) because they are building up the church. If the one who prophecies does so to “an unbeliever or [an]outsider [who] enters, he is convicted by all, he is called to account by all, the secrets of his heart are disclosed, and so, falling on his face, he will worship God and declare that God is really among you” (1 Cor 14:24-25). So the one who prophecies fulfills what the Greek word “prophēteia” means as he is “reproving and admonishing the wicked” not predicting the future so as we see by the Greek word’s meaning it is a “forth-telling” not a “fore-telling.” It is a speaking forth the truth not foretelling future events so this gift is about teaching and not about fore-telling or prophesying about future events that are not already recorded in Scripture. I don’t believe we need any new revelation today because we have all we need from God that has already been revealed from His written Word that is sufficient for doctrine and efficient to save. If you feel we need more revelation, then you are saying in effect, “The Bible is not enough; we need more revelation and I have it! ?” I cannot count the number of times that people have told me that they had a dream or God spoke to them. God does still speak to us but it is always in His Word, the Bible. In a more recent case, a broken-hearted woman told me that their pastor told her fiancé that he shouldn’t marry her because God spoke to him that she was not right for him. I searched the Scriptures and the New Testament church’s history and could not find one single example where this occurred where someone heard from God that someone shouldn’t marry someone else. God never speaks through a person who then is commanded to tell the other person to do a certain thing. Counseling is one thing but to claim that God told them you or I should do this or that is a serious mistake. That man, I believe, is a false prophet because he claimed to have divine or special revelation from God that this couple’s future would be harmful if they married. Jude 1:3 is where Jude writes that he “found it necessary to write appealing to you to contend for the faith that was once for all delivered to the saints.” Why would he find it necessary? It was because there were already false prophets infiltrating the church (2 Pet 2:1-3). The word Jude uses for “once” as in “once for all delivered” is the Greek word “hapax” which means “once, one time,” and “once for all.” This necessarily means the faith has already been delivered once and no other deliveries of Scripture are needed and this was delivered once and for all time to all the saints, including up to our present day. It is all inclusive. There can be no mistake that is a past-tense event. It was delivered, once, and now it’s done! Like a postal carrier delivers a package, there is not a continual delivering of the same package. It was delivered once and that’s it! There is no other possible meaning in the Greek construct of this passage. Related reading: Are There Still Prophets Today? Surprise, Pastor Jack! 😀 How are you doing this fine day? Good? 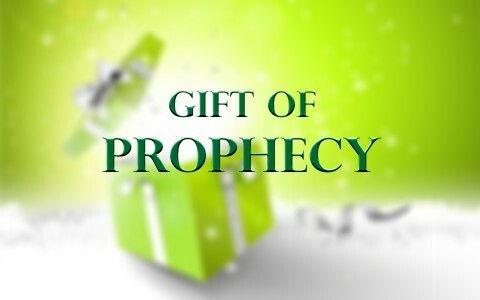 And as for the gift of prophecy, I personally consider it to be one of the most practical and useful gifts of all time. Clearly people always have a need to be convicted and to be built up. Who else better than someone who has a way with words thanks to the Lord? Amen Jack. Thanks for such encouragement my friend. You always brighten my day. All is well here. Better than I deserve and pray it is well with you. I do believe that a Prophet can tell you not to get married. I know of 3 prophets that have told people to wait or not get married. In two cases the couples did get married and divorced. The man wished he had listened in one case, their marriage may have lasted a year. God does warn His people. And when we receive the warning we have to Pray and Fast seeking God for confirmation if the prophecy was from Him or not.